The Hungarian Grand Priory of the Sovereign Order of Saint John of Jerusalem, Knights of Malta, Federation of the Autonomous Priories (KMFAP) organised its 20th international knight ceremony – for the 3rd time in cooperation with the Slovak Priory – on the first weekend of March 2013 in the magnificent castle, Chateau Bela, in Slovakia. Since the first Ceremony of Investiture of the Hungarian Grand Priory on the 15th September 2001 many years of unforgettable experiences had passed already. 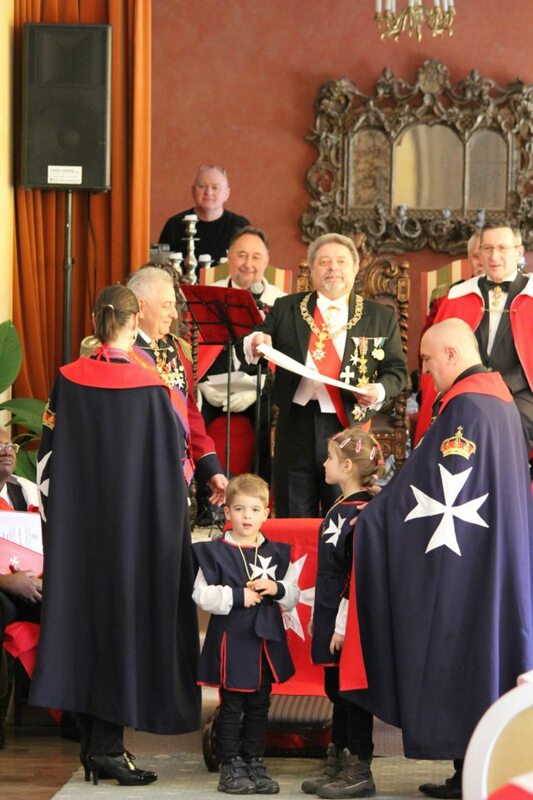 The two-day festive event began on Friday, 1st March 2013 with the General Chapter of Knights, followed by the “Watch of Arms”. During these programs the Postulants were introduced to the Grand Master, from whom they received the official Postulant diplomas, the Ten Commandments of Chivalry, and also learned about the activities and achievements of KMFAP in the year 2012. In the unique atmosphere of the Hunting Hall – following the hundreds years of tradition – and under the direction of the Grand Master, HMEH Prince José Cosmelli all the postulants could think about deeply what an important event in store for them the next day, which is worthy of their former life as a deserved recognition. The Knighthood Ceremony is such an honour, which must be understood as an award received for a lifetime work and activity. After the assembly of the knights the official gala banquet took place in the beautiful hall of the castle, with a good atmosphere, and pleasant background music during the whole evening. On the 2nd March, Saturday morning the knights and postulants had the opportunity to participate at a Roman Catholic Mass, celebrated by Monsignor Sir Ladislaus papal chaplain, Magisterial chaplain of KMFAP, in the Chapel of the Castle. At 11.00 am the Ceremony of Investiture started in the richly decorated Orangerie hall, which was crowded with family members, guests, members of the Order: dames and knights. Guests came from 26 countries. The ceremony of knighthood was honoured with the present of diplomats from four countries, with which our Order and State has diplomatic relations. The Order of Knights of Malta and the Sovereign Order of Cyprus knighted new candidates from eight countries. The Knights of Malta (KMFAP) invested nine new knights, while the Sovereign Order of Cyprus, the military wing of KMFAP – knighted two ladies and two gentlemen, who became members of the privileged group of Knights of Sword and Silence. Lovely moment of the ceremony was when the 3 children of Sir Alexander Milesz were invested to Squires and Damsel of the Sovereign Order of Cyprus. Of course our active knights and dames were also rewarded for their outstanding humanitarian work – done to the Order – and so contributing much to the development of the Order: awards, and new appointments were presented during the ceremony. The closing event of the Knighthood Ceremony was the XVI. International Ball of Knights and Bodyguards in Budapest, Hungary at the Hotel Marriott Ballroom. The newly knighted members of KMFAP and the Order of Cyprus received their official diploma during the significant ball. The great atmosphere of the ball, the delicious dinner and the high-quality performances, entertaining show programs of our Knights and Dames, who are famous artists, as well as the excellent orchestra, the dancing, the smoking patio, the memorial photography and the unparalleled beauty of the view from the ballroom to the Castle Hill and the Danube contributed much to the remarkable conclusion, and a memorable day of the Ceremony event.